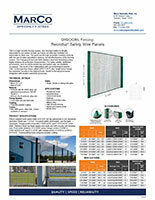 Recintha safety wire fencing panels are a high security fencing system. The structure makes it virtually impossible to use shears on and, as it does not offer any foothold, it is impossible to climb over. 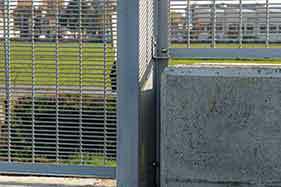 The good see-through properties combine perfectly with the use of video-surveillance devices, for full effectiveness of the fencing system. 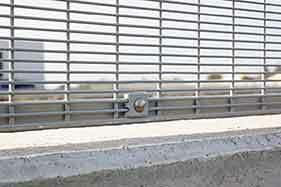 The Omega post and anti-theft stainless steel bolt fastening system highly enhance its protection characteristics. For better solidity, additional accessories, such as reinforcement top and bottom rails, are available on request. 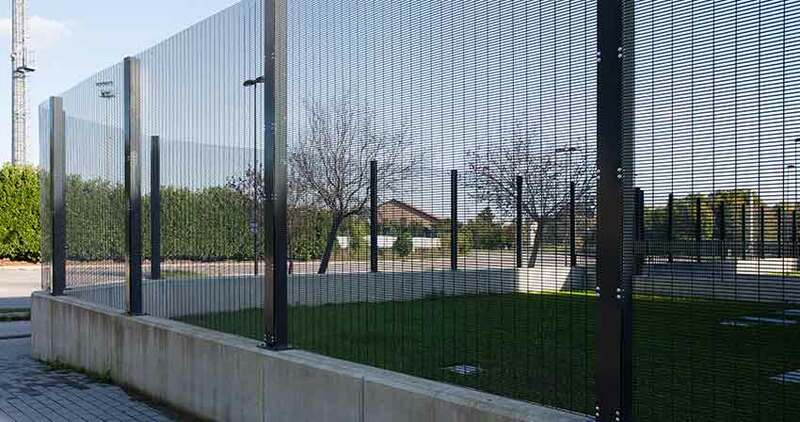 The result of the collaboration with our technological partner TSEC is the new born fence called SAFETY ACS; this “smart fence” brings the perimeter security to the highest levels, thanks to the physical barrier integration with modern electronic processes. 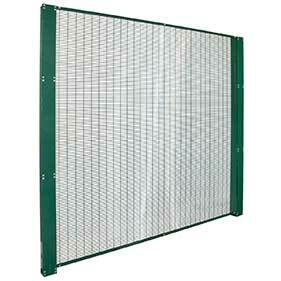 Electro-welded mesh panel made of Ø 5/32″ hot dip galvanized or zinc aluminum steel wire. Mesh size 11/2″ x 3″. For panel widths and heights, see the table. 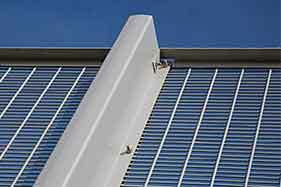 Symmetric Omega profile posts with 3 35/64″ x 5/32″ and 4 23/32″ x 5/32″ cover plate. Stainless steel cup head square neck nuts. Post center distance: 8′-4 25/64″ using Omega section 2 23/64″ x 1 37/64″x 63/64″ x 1/8″ and 8′-5 37/64″ with Omega section 4 23/32″ x 2 23/64″ x 1 3/16″ x 1/8″. Thermosetting resins polyester powder coating. H L Weight Omega Section Fixing points L Weight galv. H L Weight Rectangular Section Mesh Clip L Weight galv. We invite you to Contact Marco Specialty Steel today to learn more about the wide range of Recintha® Safety Wire Panel products and options. We’ll also be happy to provide a no-obligation quote.